Thanks to all participants for a great workshop! First set of presentations is available below. In recent years, significant advances have been made in the development of earthquake early warning systems in various earthquake-prone regions around the world. In simple terms, these systems take advantage of the fact that information about the onset of a potentially damaging earthquake can be processed and transmitted faster via modern communication tools than the speed of the travelling seismic waves, allowing to issue warnings on the order of seconds up to minutes in some cases before the damaging waves reach the target of interest to be protected. While some of these systems are at a very mature state, in particular in regions where excellent infrastructure is available (e.g., California, Japan), this is not the case in many economically developing countries. Some of these countries face an extraordinary level of seismic risk, yet large-scale seismic networks cannot be funded, and the principles used in such elaborate systems are not simply transportable to these situations. Significant research efforts are still underway to develop optimal systems for such cases, allowing for the extraction of a maximum of information from a minimum number of recordings. Earthquake early warning does however not stop with the estimation of the ground shaking that the target may expect in the seconds/minutes to come. In many regions, the situation is highly complicated by the potential generation of earthquake-triggered secondary effects, such as tsunamis or landslides. The 2011 Tohoku earthquake and tsunami disaster in Japan is a tragic example of the importance to integrate early warning and risk mitigation procedures for ground shaking and these associated risks. In this endeavour, it is crucial to take into account the specific requirements of the end users in order to make early warning useful for society. For example, critical facilities such as nuclear power plants, large dams, chemical factories, public transportation systems etc. present highly variable such requirements and as rule also involve the need for advanced real-time structural monitoring. These non-trivial tasks require intense collaboration between scientists and engineers who design the decision-making-implementation systems, and thus need to be addressed at the interface of these communities. 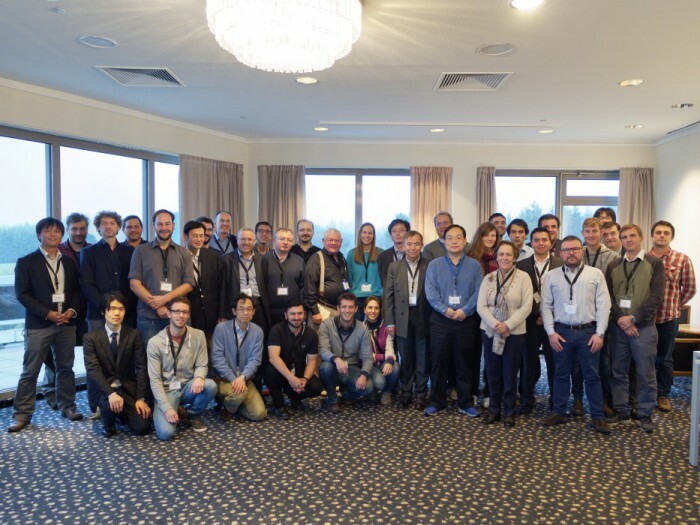 The 2015 ECGS workshop, organized in collaboration with the European Seismological Commission (ESC) and the European Association for Earthquake Engineering (EAEE), aims at providing a platform to gather around one table scientists and engineers, including researchers and engineering practioners, to discuss and look for solutions to the problems still encountered and foster their collaboration. Download the Scientific Program (with short-term modifications) as a PDF document. 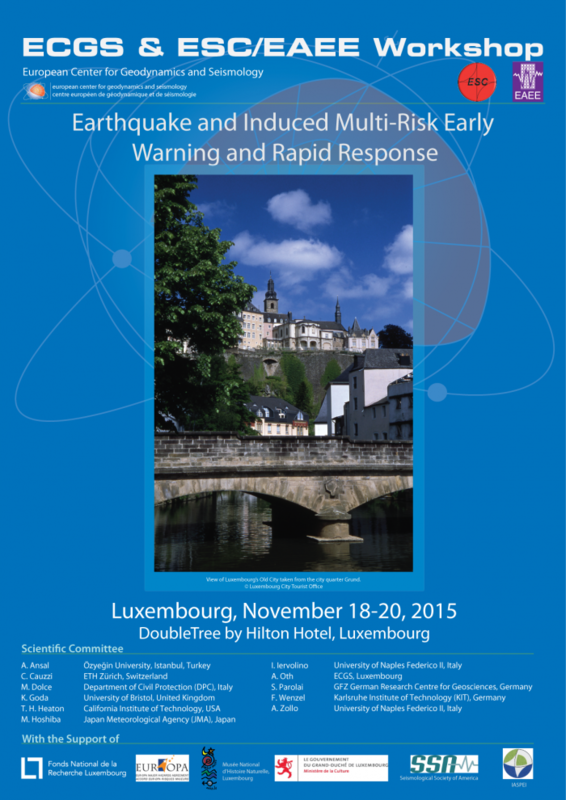 Download the Abstract Volume as a PDF document (Registered participants only). The proceedings of the workshop will be published in the Cahiers du Centre Européen de Géodynamique et de Séismologie. The deadline for submission of contributions is 11 April 2016. The manuscripts will undergo a peer review process and the proceedings volume will have a citable ISBN number and be published as quickly as possible during the year 2016. For examples of previous volumes, see here. Contributions submitted should not exceed 10-15 (absolute maximum) printed pages. Color figures will be printed at no charge. One printed copy of the volume will be mailed upon publication to every participant at no additional charge, and the PDF will be made available online. Please use the template (click here to download) when preparing your manuscripts.